American-born basketball player Mitchell Robinson joined the New York Knicks of the NBA following the 2018 NBA Draft. Unlike most NBA draftees, the talented youngster took a peculiar path to his professional career for which he gained wide media attention. After abruptly ending a possible college career at Western Kentucky University, Robinson made history as the first recruit to prepare for the NBA draft on his own accord having spent the entire 2017-18 season without playing for any college, professional or high school/postgraduate team. Mitchell Robinson was born on April 1, 1998, in Pensacola, Florida. He had the first 2 years of his high school education at Pine Forest High School in Pensacola, Florida after which he transferred to Landry-Walker College and Career Preparatory High School in New Orleans for his sophomore year. However, being relatively new to basketball, he did not make much impact in those earlier years. Robinson eventually switched to Chalmette High School where he had the highlight of his high school basketball career. He led the school’s basketball team the Owls to their first playoff victory in almost 20 years. For the entire junior season, he averaged 20.9 points, 13.6 rebounds, 8.1 blocked shots and 2 steals per game, a performance which earned him all-district, all-Metro, and all-State honors. The talented youngster put up a similar show in his senior year as he averaged 25.7 points, 12.6 rebounds and 6 blocked shots per game. He led his school to their first regular-season championship in 2 decades as well as their first district title in 21 years. For his outstanding performance, he earned an All-USA Louisiana first-team designation and also received All-District, All-Metro, All-State and the All-Metro Player of the Year honors from The Advocate. Robinson featured in the 2017 editions of both the Jordan Brand Classic and the McDonald’s All-American, becoming the first player from Chalmette to feature in the latter. 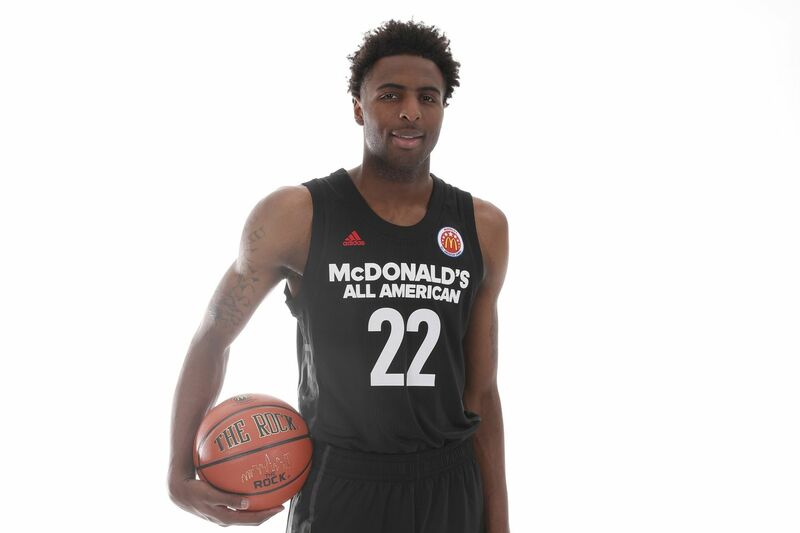 By the end of his high school career, Mitchell Robinson was considered a consensus 5-star recruit and also ranked a top 10 player in the class of 2017. For his college basketball career, he initially committed to Texas A&M University in 2015. However, following the departure of coach Rick Stansbury, he reneged on his commitment and switched allegiance to Western Kentucky University where his coach had transferred to. In July 2017, Robinson trained with the Western Kentucky Hilltoppers men’s basketball team for 2 weeks prior to a scheduled team trip to Costa Rica. However, he reportedly left the school and deserted the team before the trip abroad. This earned him an indefinite suspension from the team and after consultations with head coach Rick Stansbury, Robinson was released from the team. With the hope of getting a transfer, Robinson toured several colleges in August 2017 including Louisiana State University, University of Kansas and University of New Orleans. Without making any headway, he made a return to Western Kentucky University on August 27. On September 18, 2017, the talented youngster announced his decision to forgo his college career and instead devote the entire 2017–18 season to train fulltime for the 2018 NBA Draft. On June 21, 2018, Mitchell Robinson’s hard work paid off as he was selected by the New York Knicks in the second round of the 2018 NBA draft as the 36th overall pick. He participated with the team in the 2018 Las Vegas Summer League where he put up top-notch performance. Following the 2018 NBA Draft, Mitchelle Robinson penned a 3-year contract with the New York Knicks valued at $4.8 million. This deal puts his average base salary at $1.6 million per annum. Though the third year of the deal is not fully guaranteed, it includes a fourth-year option for the team. Mitchell Robinson came under intense media scrutiny prior to his historic selection in the 2018 NBA Draft. Despite the heightened media attention, not much was revealed about his family life. Among several members of his family, only his mother Lakesha Hall is known to the public. Details about his dad and other relatives are still pretty much sketchy. From the records available to the public, Mitchell Robinson is not known to have ever been married. It is however uncertain if he is single or not. The 2018 NBA Draftee has not made any of his past or present relationships known to the public. Barring the possibility that he prefers to keep his love life private, one may also assume that the NBA star is currently unhitched. By the time he joined the NBA in 2018, Mitchell Robinson had attained an imposing height of 7 feet 1 inch (216 cm). He also has a body weight of 102 kg (225 lbs) with a 7’4″ wingspan and a 9’3″ standing reach. In addition to other innate abilities, he is known to be exceptionally fast for a man his size. Robinson’s impressive closing speed and his extensive reach endue him with a top-notch shot-blocking ability.